(February 10, Chennai, Sri Lanka Guardian) Sri Lanka political scene is getting hot as new members are being elected for 330 local bodies throughout the country on March 17, 2011. In these elections, 12.7 million voters would be electing 3,931 members to four Municipal Councils, 39 Urban Councils and 258 Pradeshiya Sabhas. These elections in the Northern Province have become a prestigious one for President Mahinda Rajapaksa as the ruling United Peoples Freedom Alliance (UPFA) and its Tamil partner Eelam Peoples Democratic Party (EPDP) had not fared well in winning voter confidence in the presidential and parliamentary polls and local body elections for Jaffna and Vavuniya. Rajapaksa would like to use the local elections to establish the UPFA footprint in the North to legitimise his claim of being the leader of people from all communities. With the work on restoration of infrastructure and rehabilitation of internally displaced population going at a slow pace in the war torn north, the morale of a northern Tamils is low. Another irritant for the Tamils is the visible presence of the army everywhere; the army has been acting as an overlord of the civil administration. To top it all, law and order in Jaffna has deterriorated fast with murders and other criminal acts showing a sharp increase. So as of now UPFA and EPDP’s chances of asserting their presence in these elections in the North appear low. The Tamil National Alliance (TNA), the former political proxy of the Liberation Tigers of Tamil Eelam (LTTE), contesting now as the Ilankai Tamil Arasu Katchi (ITAK) – the Tamil name of the erstwhile Federal Party – is expected to capture majority of the seats in the elections in this district. They had fared well in the Jaffna local poll and parliamentary elections. The United National Party (UNP) which had some roots in the past in the North hopes to do better. The President would like to strike a deal with ITAK to prevent it from becoming a loose cannon in the power play in the North. So far the ITAK had been elusive. It is using this opportunity to leverage with the President for finalising the much delayed devolution package for Tamil minority. As of now, there is no sign of any quick progress in this regard. In the East, the Tamil Makkal Viduthalai Pulikal (TMVP) led by the President’s former ally Pillaiyan has decided to contest on its own symbol. As the three communities – Muslims, Tamils and Sinhalas – are almost in equal numbers, the election results are a wide open question, though UPFA is expected to do better. The whole local election scene became a comedy of errors as nearly 20 percent of the nominations were rejected on technical grounds and trivial errors by returning officers. Both the UPFA and the main opposition party United National Party (UNP) were mortified to find a large number of their nominations rejected in many parts of the country. This was particularly damaging for the UPFA as its nominations to 35 local councils in 12 districts were rejected. The rejection in 16 local bodies in the Jaffna district including three Urban Councils (Velvettiturai, Point Pedro and Chavakachcheri) and 13 Pradeshiya Sabhas will perhaps become the biggest spoil sport for the UPFA’s efforts to show flag in the North. To gain maximum mileage out of the publicity generated by the disastrous visit of President Rajapaks to the Oxford Union last month, pro-separatist segments of Sri Lanka Tamil Diaspora appear to be getting their anti-Rajapaksa act together. Though they are rive with internal differences, they appear to be united in bringing down President Mahinda Rajapaksa’s reputation using his problems in handling the strong adverse international allegations about Sri Lanka army’s war crimes and human rights violations. The latest salvo was fired when three plaintiffs filed a law suit in a US District court in Washington seeking $ 30 million to compensate relatives of victims of killed in three incidents during the war by Sri Lanka army. The case was filed under the U.S. Torture Victim Protection Act 1991 which provides for victims to seek compensation from individuals in foreign states who commit acts of torture. The President’s spokesman dismissed the case as a publicity stunt by “mercenaries” of the LTTE. The Tamils Against Genocide, a Diaspora Tamil organisation, expressed disappointment that the U.S, had not taken action on this issue when President Rajapaksa made a quiet visit to the U.S. said to be for medical check up during the month. The Amnesty International also expressed similar sentiments. The Eelam sympathisers were shocked when Swiss police arrested ten former LTTE representatives in the country on January 11, 2011. According to knowledgeable Diaspora columnist DBS Jeyaraj, those arrested included the present head of the LTTE in Switzerland Vijaratnam Sivanesan alias Ragu alias Ragupathy, his predecessor Chelliah Kularajasekeram alias Kulam and the influential Swiss Tiger finance chief Chelliah Jeyapalan alias Abdullah. They are facing charges of money laundering and belonging to a criminal organisation. Switzerland is the home of about 32, 000 Sri Lanka Tamils; and the country had been an important source of LTTE funding. The usually cordial relations between India and Sri Lanka came under severe pressure when two Tamil Nadu fishermen were killed within a span of ten days during the month allegedly by the Sri Lankan Navy. Though Sri Lanka vehemently denied the involvement of its navy in the incidents and attributed them to ‘miscreants’ there was widespread anger in Tamil Nadu. 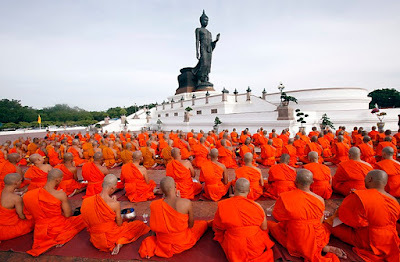 In a slightly disturbing aftermath, some fringe elements of pro-LTTE parties in Tamil Nadu raided the Mahabodhi Society in Chennai and attacked a Bhikku and damaged some of the property at the Buddhist temple. This was the first time such an attack on Sinhalas has taken place in Tamil Nadu during the last two decades. Reflecting the political sensitivities in Tamil Nadu, Government of India has reacted very strongly to the killing of fishermen. Terming the incidents as "very serious" and "unacceptable", India has said that such incidents had "no justification" and called on Sri Lankan authorities to "desist" from the use of force. India lodged a strong protest with Colombo. In the latest incident one fisherman was killed and two others injured while fishing off Kodiakarai coast on January 22. The man, who had put out to sea with two others from Pushpavanam coastal hamlet, died after Sri Lankan Naval personnel allegedly tied a rope around his neck and pushed him into the water. Earlier, in another incident on January 12, an Indian fisherman was killed in Palk Straits when Sri Lankan Navy allegedly opened fire at three fishermen, who put out to sea from Jagadapattinnam near Pudukottai. As stated in the Sri Lanka Perspectives December 2010, such incidents gain greater significance as the Congress-DMK is alliance passing through a critical phase due to the 2G scam, and as the Tamil Nadu state elections are nearing. So New Delhi’s strong reaction is not surprising. In a follow up, India’s foreign secretary Ms Nirupama Rao is slated to proceed to Colombo to discuss the issue when she calls upon President Rajapaksa and meets other leaders. In October 2008, India and Sri Lanka had reached an understanding on “practical arrangements to deal with bona fide Indian and Sri Lankan fishermen crossing the International Maritime Boundary Line.” After that, killing of Indian fishermen, particularly those crossing Sri Lanka maritime boundary had decreased rapidly. In view of this, the latest killings particularly the one said to be on the Indian side of the boundary, need to be investigated fully. The possible involvement of elements opposed to the growth of cordial relations between the two countries in triggering such incidents should not be ruled out.